75 days. Solanum lycopersicum. 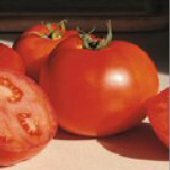 (F1) Plant produces high yields of 9 to 12 oz bright red tomatoes. They are round, firm, and highly flavorful. It has a good balance of acid and sugar. Perfect for sandwiches, salads, and slicing. A heat tolerant variety which does well in Florida. 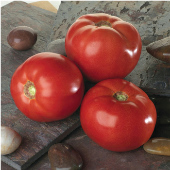 One of the most disease resistant tomato variety. Excellent choice for home gardens and market growers. Disease Resistant: V, FF, N, A, St, TSWV. Determinate. So far so good with one plant. 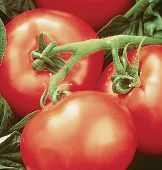 Produces about four tomatoes per day. They are very good quality consistent size. Fairly good taste quality. Have enjoyed the plant tremendously! Excellent in South Carolina.Very productive disease free plants.Stocky plants with good leaf cover. 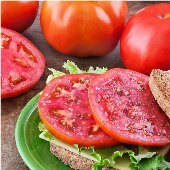 These are the best, nothing seems to bother them, I can have tomatoes well into July here in North Florida. Last summer, I was gone for a month and still had some on the plant when I returned! Planted these in fall garden in Central Texas in large grow box. The plant has done very well. It has 16 tomatoes on it in various sizes. Plant is very healthy still in mid-October. I will plant more of these next spring. I can't wait to taste them.